A non-refundable deposit of 50% of the cost of the dive weekend is required at the time of booking a dive. The balance for all dives must be paid with a post dated cheque at the time of booking. A deposit is not required to put your name on the waiting list for a dive. Please make cheque payable to the Ajax Scuba Club. Cancellations must be done by contacting the Dive Coordinator only. No exceptions. A refund will be provided (not including deposit) if you cancel three (3) weeks prior to the Friday of the dive weekend. For cancellations within the three (3) weeks prior to the dive, the dive must be full in order for a refund (less the required deposit amount) to be given. In the case of a death in the family, or other such hardship, a refund will be provided (not including deposit) at the discretion of the club executive. As a diver it is your responsibility to maintain your physical health. A cold, or ear infection, will not be considered a hardship for the purposes of a refund. All refunds will be issued on a "best efforts" basis at the Fall General Meeting or earlier by the Treasurer. What is the Ajax Scuba Club? The Ajax Scuba Club is a "not for profit" organization made up of local recreational SCUBA divers. We have been providing services to our members in the Durham Ontario area since 1975. We have approximately 80+ members, and are run by a democratically elected executive made up of Club members. The Ajax Scuba Club provides an avenue to dive in a safe and organized environment. The club organizes a full summer dive schedule for dive sites ranging from novice to advanced. Our dive charters are designed so that a newly certified diver can dive with more experienced divers to gain confidence in an atmosphere that focuses on safety. Every charter will be run by a Divemaster who will give briefings on dive sites and introduce new divers to boat etiquette and dive protocol. What does the Ajax Scuba Club do? The Club provides SCUBA diving training suitable for all skill levels from entry level to full certification courses. We also provide leadership level dive programs up to the Divemaster and Assistant Instructor Levels. We offer certified training in First Aid, CPR, and Oxygen Administration to our members. We organize supervised diving events, including: shore diving; charter boat diving; and dive trips both within and outside Ontario. Our members have access to one of the most comprehensive club dive schedules in southern Ontario! The Club also organizes social non-diving events of interest to our membership (eg. Club picnics). What kind of diving does the Ajax Scuba Club do? We engage in recreational diving. As such, we practice "no decompression" diving within the established sport diving limits. We do not practice technical or mixed gas diving, with the exception of Nitrox. 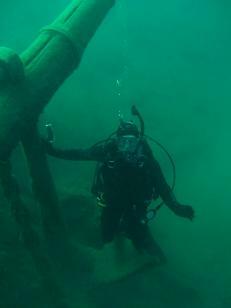 You will find us visiting some of the best wreck sites in southern Ontario, "scrounging" for old bottles and "junk" in the 1000 Islands, or enjoying the amazing beauty of a Caribbean coral reef. Almost any place you can get wet has something to offer! We are very much focused on safety. All Club diving events are supervised by Divemasters and Rescue Divers. Our Club Divemasters are fully trained and equipped to deal with any emergency situation. We're very proud of our safety record and work hard to keep it that way. What other services does the Ajax Scuba Club provide its members? Besides access to the diving activities, continuing education, and social events mentioned above, we offer low cost equipment rentals and free air fills to members for any club diving event. The Club also publishes newsletters at regular intervals which provide updated information concerning Club diving and non diving activities, club executive updates and interesting general diving related tips and information. Where does the Ajax Scuba Club meet? Our facilities are located at the Ajax Community Centre in Ajax Ontario. Club members meet Thursday evenings prior to a scheduled club dive, and Tuesday evenings following. The Club “ backroom” for equipment pick up prior to dive weekends is located at the south-east corner of the Ajax Community Centre building. We have a general membership meeting in the fall each year at which time we elect our executive, A second general meeting is in the spring during which members may renew their memberships and book the dives which they wish to participate during the upcoming dive season. Who is eligible to join the Ajax Scuba Club? Divers already certified by a recognized SCUBA training agency. Uncertified divers who register to take our Open Water Diver Course (NOTE: a free club membership is included when you learn to dive with our club). Anyone who wants a non-diving social membership. Is a checkout Dive required for New Members? Certified Divers who wish to join the Ajax Scuba Club, and who have not received their Open Water Certification through the Ajax Scuba Club, must have their dive skills reviewed and evaluated by an ASC Divemaster prior to participating in any Club sanctioned dives.